A decadent bite-sized chocolate treats that are very easy to prepare. Each individual crust is made from cream-filled chocolate sandwich cookies and roasted hazelnuts while the filling is a glorious concoction of cream cheese, sugar and Nutella spread! You don't even have to scrape out the chocolate sandwich cookies' cream filling as it makes the crust moist and less crumbly. Just dump them in a food processor, along with the hazelnuts and butter, to create a perfectly crunchy crust for these miniature cheesecakes. 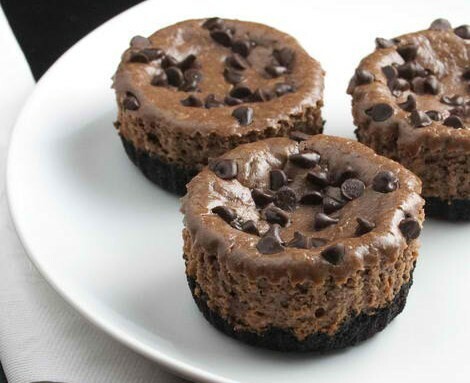 Here is an easy dessert recipe for Mini Chocolate-Hazelnut Cheesecakes. Preheat the oven to 350°. Line a 12-cup muffin tin with paper liners. Lightly grease the liners with vegetable oil spray. Place the cream-filled chocolate sandwich cookies, roasted hazelnuts and butter in a food processor and process until fine crumbs form. Spoon crumbs mixture into individual cups and press using a flat-bottomed glass. Bake for 5 minutes. Mix together cream cheese, Nutella, sour cream, eggs and sugar using a food processor until smooth. Fill the prepared crusts with the cream cheese batter until it nearly reaches the top. Sprinkle chocolate chips on top of each cup and bake for about 20 minutes, until the cheesecakes have risen and the surfaces are lightly cracked. Let the cheesecakes cool slightly, then transfer the muffin tin to a rack and freeze for 10 minutes, until the cheesecakes are slightly cooled. Store leftovers (if any) in an airtight container and refrigerate for up to 3 days.